A detour is set up from West Price Creek Road to Trout Farm Road. UPDATE 4/5/19: Per Commissioner Chair Rob Jones, a contract was signed with GSI (GeoStabilization International) earlier this week to begin repair. Initial work will focus on opening one lane for traffic within the next few weeks. The remainder of the work could take up to 55 days. The cost is 1.8 million with initial help from the state using LMIG funds for $500,000. EXP provided a letter of recommendation based on the 3 repair proposals for the Jones Mountain Road slide repair. The letter states that three original proposals were received, two provided follow-up responses to proposal review comments sufficient to warrant further consideration and possible recommendation for the project's Contractor. Proposals were received and evaluated from KAM Contracting Southeast, GSI Geostabilization International, and Shane Godfrey PB&J Contracting. 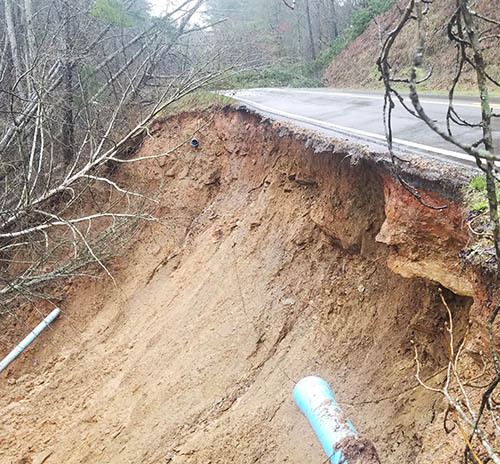 March 22, 2019: Due to recent rains and flash flooding a section of Jones Mountain Road has washed out and the County has closed the road in this area. Commissioner Rob Jones estimated it would take a minimum of a month to repair. 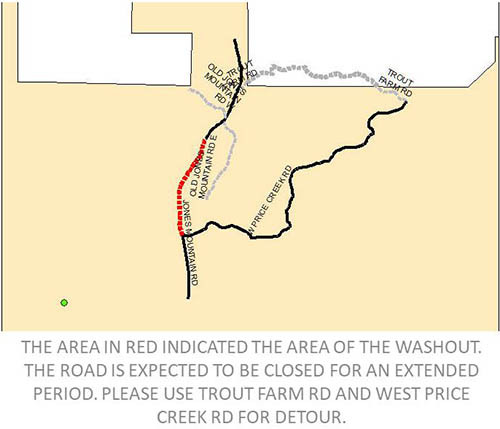 A detour is set up from West Price Creek Road to Trout Farm Road. Use caution, as this is a small gravel road. Pickens County Water has shut off a portion of water service and will be off for an indeterminate amount of time. Areas to be affected by this outage are north of Fisher Creek Road on Jones Mountain.